Thomas Was Alone tells a heartfelt tale of friendship. 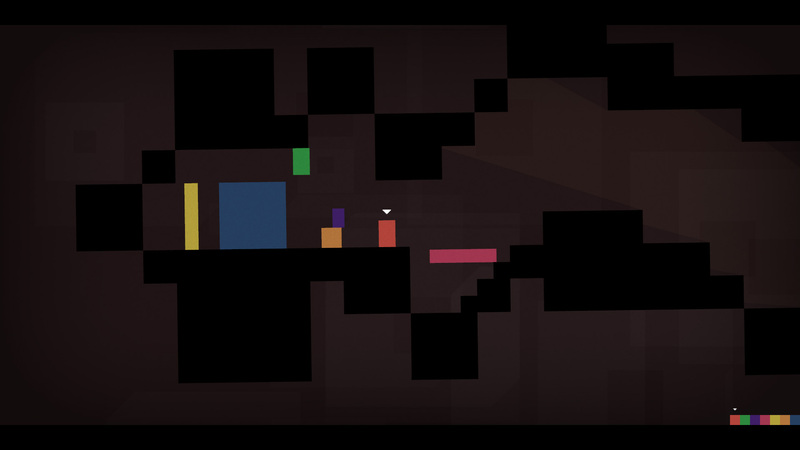 Developed by Mike Bithell (the PlayStation ports handled by Curve Studios), it follows a group of sentient artificial intelligences in the form of quadrilaterals as they attempt to escape – or rather, “emerge” – from their confines. It begins with Thomas, a newly formed AI longing for camaraderie, and a dozen other characters searching for purpose in their newfound lives, all working together to discover it. It’s a charming, wonderful, and surprisingly poignant story. Witty dialog and amusing narration deliver and push it forward splendidly, whilst warm and melancholic beats invoke the sense of loneliness and camaraderie that Thomas struggles with. Danny Wallace provides the voiceover, reading his lines wistfully and excitedly as the situation requires. Text scrawls kick off each new zone, containing allusions toward the effects of the AIs’ awakening from former employees of a software company, lending background to the story and hinting at what’s to come. 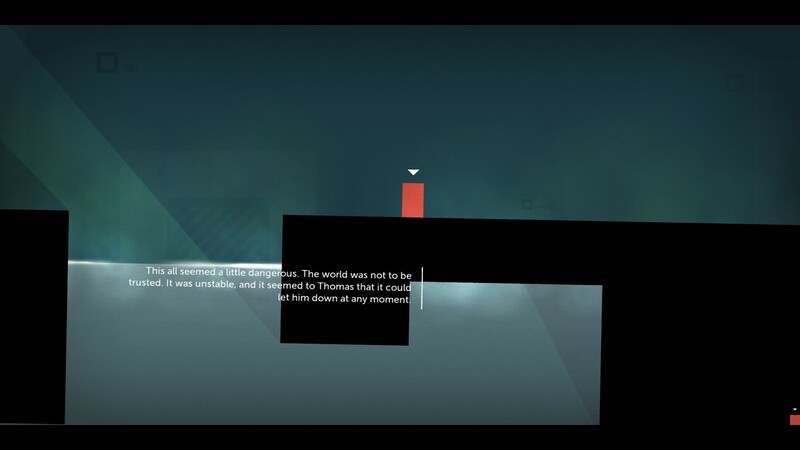 For being but a bunch of shapes, Thomas Was Alone humanizes them incredibly well. They all have their problems and insecurities (like an inflated ego, superiority complex, or fear of being rejected for being “different”), which serves to make you care about them as they grow. It takes what would normally be a really sappy, and perhaps childish story, and makes it truly heartwarming. It’s a fun journey to partake in. Thomas’ observations often ring true about the world – both his and ours. Thomas and company move through the high-contrast cyberspace by running and jumping about. It’s a platformer in the simplest execution possible. The only obstacle is the environment, walls and spikes a common foe. The team has to work together to traverse the road ahead. Everyone has their own talents and limitations, but they’re easily overcome through coordination. Thomas is the most balanced of the bunch: he’s small and can vault over most obstacles. Chris, on the other hand, is smaller and can therefore move through crevices, but can leap only half as high as Thomas, whereas John can soar further than both combined, due in part to his tall stature. Claire is large and hardly athletic, but can float in water; Laura can barely jump at all, but her body acts as a springboard. James’ gravity is inverted, meaning he moves across the ceiling, and lastly, Sarah can double-jump. The goal of the game’s 100 levels is to use these characters’ abilities in conjunction with one another to reach the exit portals. Makeshift staircases allow ascent for the jumping impaired, for instance, while bridges allow safe passage across precarious pillars. There’s never any question as to the methodology, though, as solutions to most stages are clear upon arrival. The question in these isn’t so much a question of “how” you progress so much as it is a case of discerning what technique you need to employ. The first half comes off a bit dull, as such. Diverse lot of quadrilaterals, there. More characters arrive in the second half, however, bringing with them some additional challenge. Stages become larger, prompting expeditions to get a feel for the land and an idea of how to proceed. Because you begin moving with a bigger group (many of the early stages only grant you access to a couple folks at a time, not often giving you the full group you’ve accrued to that point), you start facing more challenges on how to proceed. Not just in traversal, but also in color-coated buttons that only certain rectangles can press. It’s here Thomas Was Alone shows its devious side. For the greater part of the experience, it’s a simple run from point A to point B. But as your crew expands, the levels adjust to keep things fresh. Challenge emerges, hazards start to present themselves, the platforming gets trickier. It becomes a more intricate game whilst maintaining that deceptive mechanical simplicity. It’s brilliant. It’s minimalist beauty and elegance at its finest.